Every good cook has a few key tools he or she relies on to deliver delicious dinners. Of course, great cooking requires a discerning palate to distinguish what flavors combine well together. Another is an ever-expanding recipe repertoire. And finally, quality knives to slice, dice and chop. For years, stainless steel was the choice of blade, but it’s not invincible. As it gets used, stainless steel can chip or pit, rust if not properly cleaned, and is vulnerable to reacting with acidic substances. There’s also the possibility of the metal imparting a metallic taste on certain foods. These are some of the reasons why home cooks and professional chefs alike have switched over to ceramic blades. Ceramic blades are constructed out of extremely strong, hard materials, such as zirconium oxide. The advantage is that the knife maintains its sharpness much longer than other blade materials. Some proponents suggest these blades can go years without sharpening. The ceramic element is strong, but it’s not heavy. The lightweight blade creates less drag or resistance, so you can cut and slice away without experiencing hand fatigue. Because the material is virtually nonporous, it’s not likely to absorb and retain odors. There’s no worry you’ll be transferring garlic or onion flavors when slicing fruit. There’s no metal in the blade so there’s no chance to rust, which means a longer lifespan. While the hardness of a ceramic blade is great for retaining sharpness, it also can be a detriment due to extreme brittleness. It’s advised that these knives not be used to cut through bones or frozen food. Also, don’t use it to apply pressure to ingredients, such as smashing garlic into a paste. Although some manufacturers state their products are dishwasher-safe, many experts caution against it. A quick washing with soapy warm water should suffice. As noted earlier, the ceramic material has a brittle nature, so it’s not recommended for certain kitchen duties. These knives should primarily be used to cut soft foods. Finally, to keep your ceramic knives in their best condition, store them in protective sheaths. If you want the strength of a ceramic knife, but need some versatility, then check out this nine-piece set. 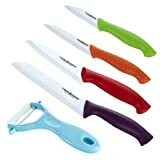 It includes four different sizes: 6-inch Santoku knife; 5-inch utility knife; 4-inch fruit knife; and 3-inch paring knife. Each one includes a protective sheath. Plus there’s a vegetable peeler. 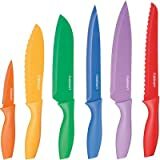 This set offers a serrated bread knife, chef knife, utility knife, paring knife in addition to an 8-inch slicing knife and 7-inch Santoku knife to fulfill your knife needs. They come in a rainbow of colors, so if you wish to dedicate one to meat and one to vegetables, it’s easy to keep from cross-contaminating.